John Parks Tazewell was born in Wilmington, Delaware, on September 25, 1920, son of Calvert and Sophie (Goode) Tazewell. He graduated from Maury High School in Norfolk, Va. in 1939 and entered the U. S. Naval Academy, Annapolis, Md. the same year. He was graduated in 1942, commissioned Ensign. Following his graduation from the Academy, he served as Torpedo Officer on the USS O'BANNON and received the Presidential Unit Citation. In January 1943 he reported on board the USS ALABAMA as Division Junior Officer and from May 1944 to May 1946 he was Fire Control Officer on the USS WEST VIRGINIA, receiving the Bronze Star (V). He served as Fire Control Officer and Assistant Gunnery Officer aboard the USS WISCONSIN, from May 1946 to July 1948. He enrolled in the USN Postgraduate School in July 1948 for instruction in ordinance and fire control and continued his studies at the Massachusetts Institute of Technology at ambridge, for which he received the degree of Master of Science in Electrical Engineering in June 1951. He was elected to the graduate honor society, Sigma Xi, at MIT. He was assigned to the Gunnery and Mine Countermeasures Project Office of the Staff, Commander Operations Test and Evaluation Force, until April 1954 when he reported as Executive Officer aboard the USS D. H. FOX. In September 1955 he was transferred to the USS BOSTON as Weapons Officer where he served until November 1957 at which time he was transferred to the Bureau of Naval Ordinance (later Weapons) as TARTAR project Officer. He remained in that assignment until June 1960 when he became Commanding Officer of the USS LAFFEY. Following this he served as Commander Norfolk Test and Evaluation Detachment of the Commander, Operational Test and Evaluation Force until October 1964 when he became Commander Destroyer Division 262. 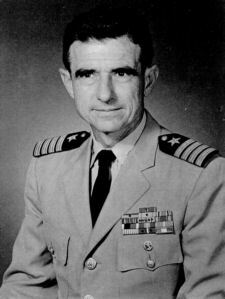 In August 1965 he was reassigned as Readiness and Training Officer on the staff of the Commander Cruiser Destroyer Force, U. S. Atlantic Fleet until August 1967 when he became Program Manager, Advanced Surface Missile Systems, Naval Ordnance Systems Command in Washington, D. C.
Other medals that Captain Tazewell has received include American Defense-Star, American Theater, Pacific Theater-9 Stars, European Theater, National Defense and Victory. His official home address is Norfolk, Virginia. He is married to the former Elizabeth Newton Taylor and they have five children, John P. Jr., Richard W., Littleton W. Tazewell, Judith C. Stephens, and Elizabeth T. Hogue.